The 61st Anniversary Washington International Horse Show (WIHS) will be held Oct. 22-27, 2019, at Capital One Arena in Washington, DC. An equestrian tradition since 1958, WIHS is the country's leading metropolitan indoor horse show offering championship sport and fast-paced entertainment and fun. Each October, more than 500 top national and international horses and riders, including Olympic veterans, gather in the nation's capital to compete in thrilling equestrian sport. Since its debut, WIHS has been a Washington institution attended by presidents, first ladies, celebrities, military and business leaders, as well as countless horse enthusiasts of all ages. Washington International Horse Show Association, Ltd. is a 501(c)(3) nonprofit charitable organization headquartered in Washington, DC. 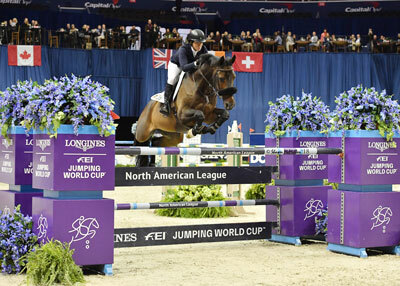 WIHS is rated FEI CSI4*-W, USEF Premier Hunter, USEF 6* Jumper. Tickets for WIHS 2019 will go on sale August 1 and will be available online through Ticketmaster.com or by calling 1-800-745-3000. Tickets may also be purchased in person at the Capital One Arena Box Office. Group Sales Department (202-661-5061) will assist you with ticket discounts, special seating arrangements, and personalized service. The minimum group size is 10. For information about Capital One Arena accessible seating and services, call 202-661-5061 or 202-661-5065 (TTY). Capital One Arena is a state-of-the-art professional sports and events venue and has been home to the Washington International Horse Show since 2000. Capital One Arena is located at 601 F Street, NW (corner of 7th and F Streets, NW), Washington, DC 20004. Check back in June 2019 for details on hotel and travel partners. Take Metrorail or Metrobus to the "Gallery Place-Chinatown" stop for an easy trip to the show. The Metro station is located at Capital One Arena. Directions to Capital One Arena. Capital One Arena has its own parking garage located on 6th Street NW, under the building. The charge is approx. $20 for event parking. The garage opens 1 ½ hours before show time and closes 1 hour after the conclusion of the event. Alternatively, there are several public parking garages near the building, including Gallery Place’s parking garage on 6th Street NW and the parking garage next to Rosa Mexicano restaurant on F Street NW. There are at least 10,000 parking spaces located within blocks of the arena. Follow WIHS on Facebook, Twitter, Instagram, Pinterest, and YouTube for photos, videos, and news about the extraordinary horses and riders competing at the show, in addition to historical information, special contests, and international equestrian news. Enjoy fine dining while watching world-class equestrian competition in one of the greatest cities in the world. Ringside dining is available on two specially built clubs overlooking the arena, offering excellent food and beverage, and wonderful views of the action in the ring. For more information about WIHS dining and sponsorship packages, please contact Mary Helen Shaughnessy at maryhelen@wihs.org or 202-525-3679. Over the years, notable guests have included President John F. Kennedy, President Dwight D. Eisenhower, President Gerald R. Ford, Alice Roosevelt Longworth, William Shatner, Bruce Springsteen, General William Westmoreland, Christopher Reeve, John Cleese, Zsa Zsa Gabor, Arthur Godfrey, and many more. Show memories abound, like in 1970, when a WIHS carriage marathon with horse-drawn vehicles paraded to the White House to give First Lady Mrs. Nixon a carriage ride around the South Lawn of the Executive Mansion. The standing North American indoor Land Rover Puissance (high jump) record of 7' 7-1/2" was set at Washington in 1983 by Anthony d'Ambrosio and Sweet 'n' Low. The WIHS Hall of Fame, established in 1997, recognizes leading horsemen and horsewomen whose careers in the horse industry, either in the saddle or behind-the-scenes, have made a significant impact on WIHS. Visit the WIHS Hall of Fame. WIHS is honored to be named an Official USEF Heritage Competition by the US Equestrian Federation.